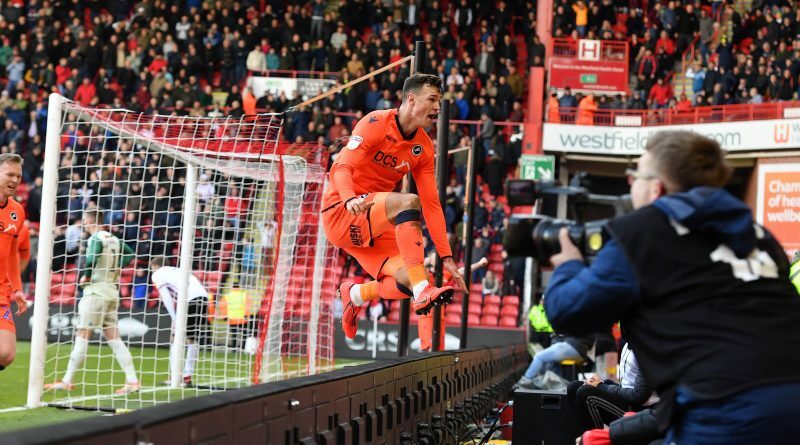 Jake Cooper scored a dramatic injury-time equaliser to earn Millwall a priceless point after Ben Marshall had earlier missed a penalty against 10-man Sheffield United at Bramall Lane. In a game of few chances, Gary Madine – who replaced the injured Chris Basham early in the opening period – tapped home from close-range at the start of the second-half and it looked like the Blades would win for a ninth time in their last 10 home games and keep up their automatic promotion hopes. 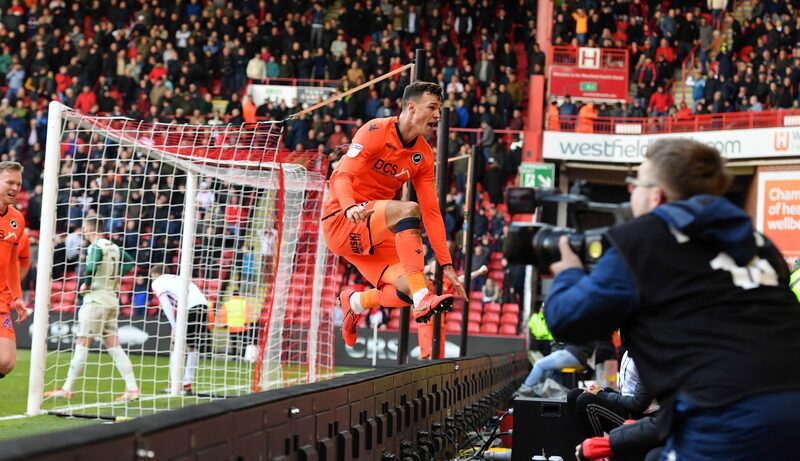 But just moments after Marshall fluffed his lines from 12 yards, Cooper headed home after Tom Elliott’s header had been saved to extend Millwall’s unbeaten Championship run to three matches. The Lions drop to 20th in the table but remain two points above the relegation-zone after Rotherham United came back from 2-0 down to draw with Stoke City. Neil Harris’ side still have a game-in-hand. Sheffield United dominated the early exchanges, but tame efforts from Mark Duffy and Enda Stevens were the closest the Blades came to taking the lead. The hosts were struggling to break down a disciplined Lions back three in a relatively drab first-half affair and David McGoldrick took matters into his own hands just past the half-hour mark and almost gave his side a spectacular advantage. The former Ipswich Town man collected the ball, cut inside and curled a wonderful effort towards the far corner, but it sailed just over – with Dave Martin beaten. And despite a scrappy opening period, the Blades could have gone into the break in front. Oliver Norwood’s corner fell to Stevens, who advanced into the box before smashing an effort towards goal that deflected off Lee Gregory, but fortunately for Millwall, into the grateful arms of Martin. Sheffield United began the second half in similar fashion, going close twice in quick succession through McGoldrick and then Madine, but both of their efforts were blocked. But less than two minutes later, the Blades did break the deadlock. McGoldrick found Fleck, who skipped into the box before unselfishly squaring for Madine, who swept home into an empty net. 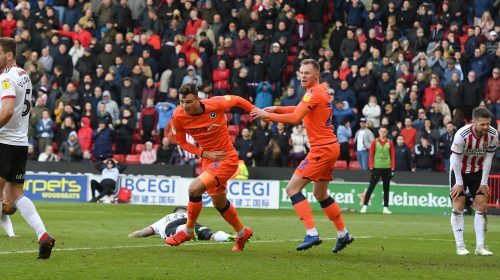 It took 73 minutes before Millwall really got going and Jed Wallace almost levelled – volleying narrowly wide of Henderson’s goal with the Blades shot-shopper a mere spectator. At the other end, Martin had to be on his toes to keep out McGoldrick’s near-post effort – the Lions goalkeeper palmed his effort around the post for a corner. 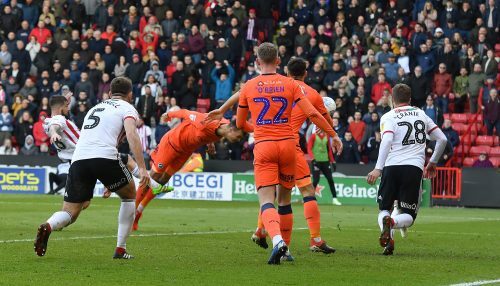 Mahlon Romeo came even closer to making it 1-1 in the 78th minute – blasting a free-kick towards the far corner from 35 yards, but his arrowed effort deflected narrowly wide before McGoldrick hammered past the far post at the other end as Sheffield United looked for the killer second goal. But Millwall continued to apply the pressure and it looked like their efforts would be rewarded when they were awarded a spot-kick four minutes from time. Firstly, Ben Thompson tested Henderson from 25-yards, before Shane Ferguson picked out Elliott, who headed towards the far-corner, but his goal-bound effort was handled by John Egan on the line. To add insult to injury for the hosts, Egan was giving his marching orders, but Marshall – who scored from the spot against Leeds United – was unable to take advantage, crashing the resulting penalty on to the bar. But the Lions didn’t give up and got their rewards deep into injury-time as Cooper pounced to head home Marshall’s cross for his first Championship goal since New Year’s Day after Elliott’s initial header had been stopped by Henderson.